Children should not be a number. : Teachers cheer for students to fail? Teachers cheer for students to fail? As children head back to school this week in New York State they may be subjected to Student Learning Objective assessments in the first week or two of the school year. An SLO pre-test is supposed to determine a student’s prior knowledge of a subject to help calculate teacher growth for an educator’s evaluation. Now imagine how students feel, particularly very young children, when they encounter words and phrases completely foreign to them at the beginning of the school year. Will frustration set them up for failure at the beginning of the school year? This madness is a result of the new teacher evaluation law in New York. 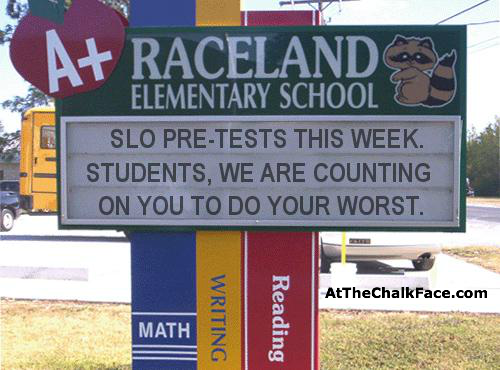 Teachers without a state test tied to their course may need to use a SLO pre-test depending on their grade level or subject. Educators will actually hope their students score low on these pre-assessments so the teacher can show more academic growth from pre-test to final exam. This is what education reform policy has done to our schools: Teachers will cheer against their students. Parents need to determine if their child will be taking any of these assessments and let their school know that their child will not be taking these tests that are a waste of time and used for invalid methods of teacher evaluation. More on the 95% Participation question.